Seaside villa "Under the pines" of the 1930s, completely renovated (work completed in June 2014). Put your luggage, forget your car, do everything on foot. Ideally located 200m from the port, restaurants, shops and beaches and 400m from the town center (where you will find bakeries pastry, pharmacy, doctor, butcher, fishmonger, house of the press, La Poste, banks, futures, cafes, PMU, cellars, hairdresser, beautician, various clothing shops ... etc. Classified 3 stars in the category of furnished tourism. Capacity of 8 people on the ground floor: kitchen, living room, bedroom (bed 160) with bathroom, separate WC with washbasin, laundry (with washing machine and sink). First floor: bedroom with 140 bed, bunk room, bedroom with 2 beds of 90, bathroom, separate WC. Relaxing garden of about 500m2 closed without vis-à-vis. Possibility to park 2 cars. Equipment: TV, Dishwasher, pyrolysis electric oven, microwave, induction hob, fridge with freezer compartment, coffee maker, kettle, toaster, raclette service 8 pers, robot, washing machine, vacuum cleaner, dryer - hair dryer, iron, charcoal grill, 2 garden tables, 2 sun loungers, 4 sun loungers. New in 2016, the house is equipped with internet access LIVEBOX. Sailing school, cinema, bike rental, bike trails within the town. Park Puy du Fou at 1:15. Zoo and Aquarium 20 min. Indian Forest Park tree climbing to 15 min. Ogliss Park (water park) 15 min. TGV station 25km match up with Jard on sea. If you wish we do the housework for you, the cleaning fee is 100 €. Really loved our week at no 23 (1 of 3 in the street!). Great location for young and old. Enclosed garden for kids, short walk to beach and well equipped kitchen. The owner is lovely and smiley - didn’t speak much English which tested our French to the max which was good practice for us. Definitely recommend! Spent a week in this lovely house with my husband and three children. For us, it was in a superb location, minutes from the port and town centre. I loved the mix of traditional French style and the comfort of being modern. Really well equipped house, everything a family should need, including a safe garden with ample private parking. You will need your own sheets, or can hire them. A deposit is required upon arrival and you will have to clean the house thoroughly when you leave or have the option of paying extra for a cleaner. It’s such a spacious and pleasant house, we enjoyed relaxing in. The beds are very comfortable and the showers are powerful. I really hope we can stay here again. We really enjoyed our stay at the house this August. It is the most attractive house in the street and plenty of people stop to have a look! It isn't that easy to find, the satnav couldn't locate the road..
Well equipped and nicely decorated. Wonderful big windows to open when it is hot. Clean, with good showers and a nice utility room which has a separate door to the garden. Only downsides were the garden which is not up to much, pretty scruffy with dying plants and weeds in abundance (a shame as it could look really pretty) and the bedding (which we paid extra for) which was cheap (I couldn't cope with the bottom sheet and thankfully my parents were arriving a few days after us and brought something decent). Also the double bed upstairs is very noisy even when you turn over.. If you walk the other way from the house you come to the town in about five to ten minutes, passing Le Kou De Ta restaurant, which is more expensive than some but well worth it. The town has the usual sort of shops and a couple of boulangeries and the market is just off a side street on a Monday morning (very busy). The Super U is a few minutes drive on the other side of town and is a good size, also has a petrol station. Some nice beaches nearby with some great rock pools too. Boisvinet is good for the sea when the tide is in and great for rock pooling when it's out (found lots of starfish). Plage de le Mine, a few minutes drive is good even when the tide is out as there are rock pools but there is a patch of just sand in the middle. Places to visit nearby would include Talmont St Hilaire which has a castle, Les Sables d'Olonne which has a shell museum and huge beach, Le Puy de Fou which is an hours drive but worth it for the bird display alone, and the O'Gliss water park which is great. The hosts were pleasant, although can't speak English so we managed with our little bit of French and some sign language! We would stay again and would recommend it to others. We could not have asked for more. Great location, many eateries, the port, market, shops, bike hire, beaches all in a short walking distance. The owners are lovely, friendly and very helpful. The house is very tidy and had all we required. It's spacious and very well thought out (big showers, utility room, seperate dining area). Our two young children were able to play outside behind locked gates, in a secure enclosed environment. There is secure off street parking, ample for two vehicles. 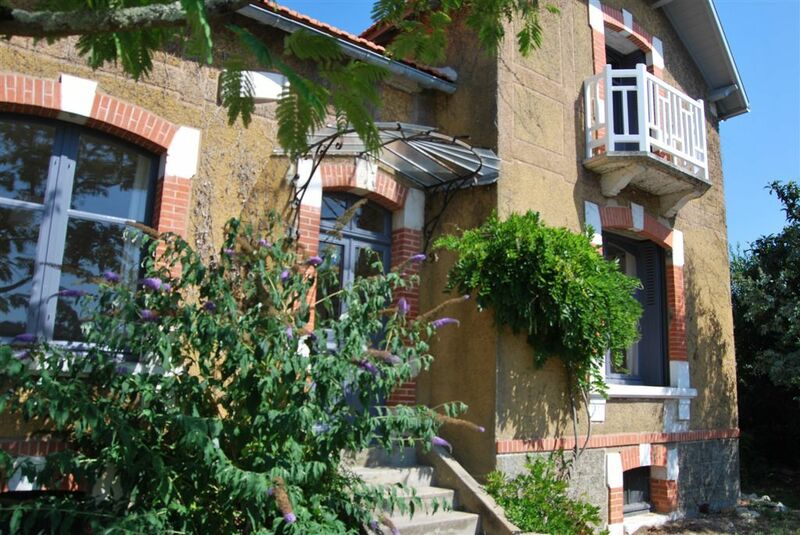 We were very taken with Jard Sur Mer and the surrounding areas. There are plenty of towns and villages, beaches and other attractions to visit within a short drive if you wish. We took the ferry to Cherbourg and had a 3 hour drive to the house, and returned via the tunnel with an overnight in Mont Saint Michel which broke up the return and allowed us to keep the holiday going one more day. I would happily and thoroughly recommend this property to all. We intend to go back. Charmants locataires Anglais . Respectueux et dynamiques. Très bonne semaine passée dans cette jolie Villa, restaurée avec soin et très confortable. Accueil chaleureux avec sapin de Noël et brioche vendéenne. Maison très fonctionnelle et agréable à vivre. La proximité de la mer est un plus! Night Life on the harbor all summer. Si vous ne souhaitez pas effectuer le ménage en fin de séjour, vous avez la possibilité de prendre le forfait ménage moyennant 100 euros. Si vous souhaitez l'effectuer vous-même, il vous sera demandé à votre arrivée une caution ménage de 100 euros, qui vous sera restituée en fin de séjour si le ménage a correctement été réalisé. Location de linge de lit possible aux tarifs suivants : 16 € pour un lit double et 8 € pour un lit simple. Une caution de 400 euros vous sera demandée à votre arrivée pour couvrir des dommages éventuels, elle sera restituée en fin de séjour.